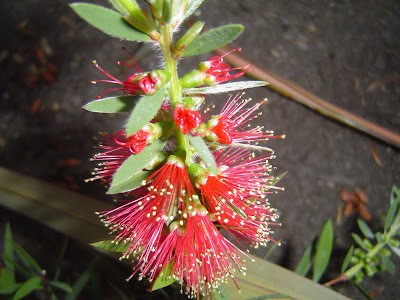 Here is what’s blooming in the danger garden on June 15th…Callistemon ‘Clemson’ above. Just planted this year and it’s only about 8” off the ground but has 6 fabulous little blossoms. Unknown shrub/bush, we inherited these with the house, I have no idea what they are and would really appreciate an ID. The fragrance is strong and slightly pungent. They are very large (an overall shot would have been nice wouldn’t it?) and deciduous. 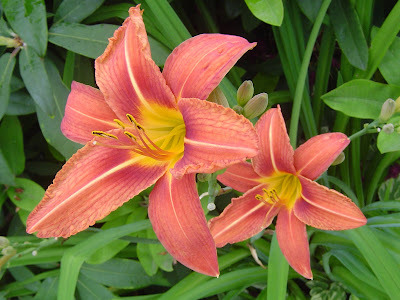 Unknown and inherited Day lily – love the burnt orange color. Eryngium planum ‘Blue Hobbit’ I especially love these flowers at this stage before they start turning blue. 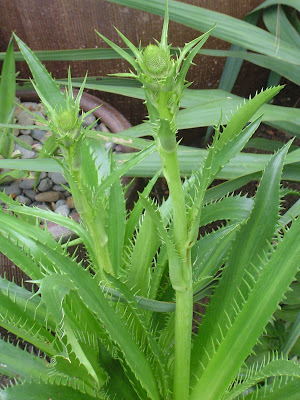 Eryngium agavifolium, the bloom spike is just getting started; it will reach at least 3 ft. The bees love them. Eryngium planum ‘Sea Holly’ so blue that I’ve been asked if I paint them. 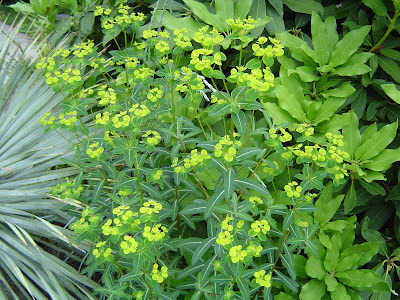 Euphorbia ‘Martini’, fresh euphorbia blooms in June! 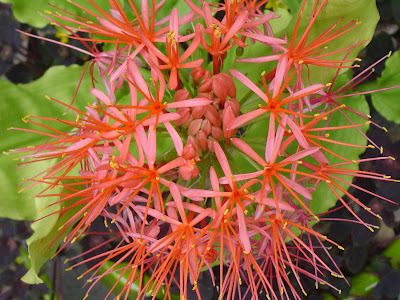 Hebe Red Edge, I really like these Hebe much better when they are not blooming. I'm weird that way, a lot. In fact I've got a Hosta that would already be blooming but I keep cutting off the bloom stalks, they just ruin the look for me! 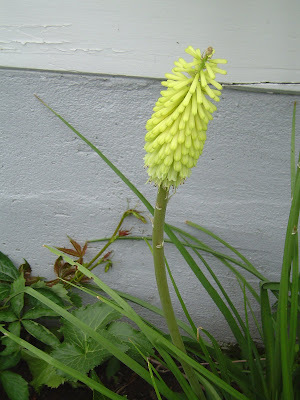 Kniphofia ‘Green jade’ the green is starting to fade to yellow but still a striking flower. In my experience these keep on producing new bloom spikes for months. 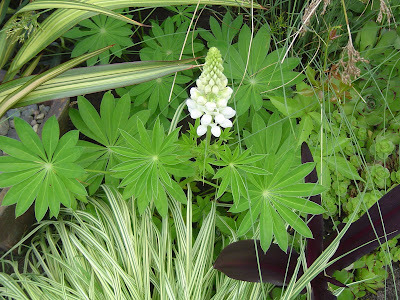 Lupine, just one little bloom so far, but since I love these for their foliage that’s just fine with me. 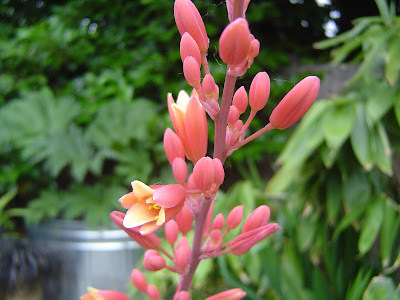 Hesperaloe parviflora - red yucca. The best thing about these flowers is that they last forever. It’s been going strong for a month now and showing no signs of fading. Hi DG, I wish I could help you ID that lovely white-flowering shrub but can't. No doubt it's not hardy here in Spokane :-) Thanks for stopping by today, I was going to post for GBBD, too but the peonies seemed like more fun! 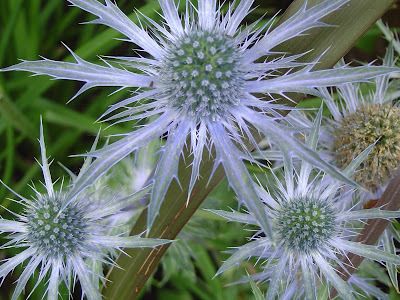 I keep meaning to plant Eryngium 'Sea Holly,' and now I want 'Blue Hobbit' too. So cute! 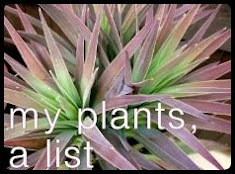 It looks like your red yucca is going gangbusters. They're blooming all over town in Austin. I like how Eryngium ‘Blue Hobbit’ looks a little too perfect to be real. I wonder if that calistemon will make it, or do you overwinter that one inside? I gave one to my mom for a present one year, but winter was the end of it. I'm no privet expert, but I agree with Carol, that's what it looks like to me too, but I thought privets were evergreen. VW - the peonies were definitely the way to go. 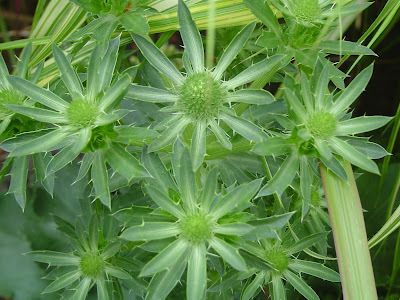 Pam - I am a little surprised that you like the Eryngium's...but they are fabulous! 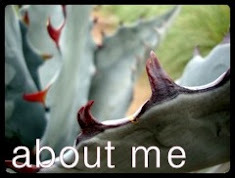 I wish I could see the red yucca madness in Austin. Do they last a long time there or does the heat wear them out? Carol - thank you for visiting! I don't think it's a privet but I will investigate further. Megan - the Calistemon is supposed to be hardy to 10 degrees and it's in a protected area. But still it is a crap-shoot. Ok...I gotta check out the privet idea. This is the huge shrub wall on the north side of the patio...you still think it could be a privet? I thought they stayed smallish. 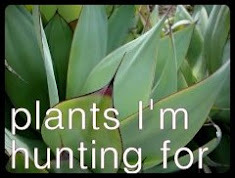 You have some very nice plants there. How long did your red yucca take to bloom? We're still waiting on ours. I love the eryngiums. I left behind a lovely deep metallic blue one at our last house, and you've reminded me I need to replace it. That Hesperaloe parviflora is gorgeous. I need one! 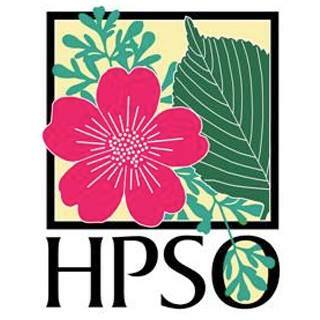 And I absolutely understand about hosta blossoms. They add nothing and I really don't care for them at all, but it hadn't occurred to me to (gasp) actually cut them off! Bravo! I love your plant choices. I was going to get sea holly, now I know that I want to try Blue Hobbit. It's really the name that got me you know. 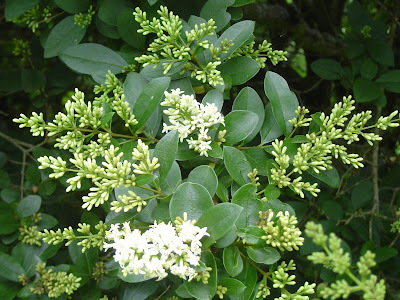 If it's privet, now is about the time the hedge in my previous garden used to bloom so it's about right. I was horribly allergic to them, and found their fragrance icky. Ours were 8 ft. tall or maybe more. 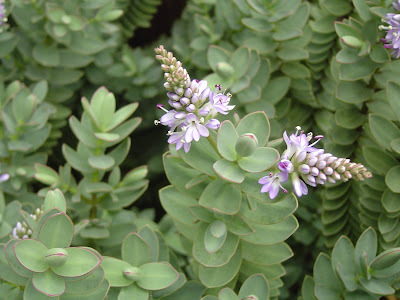 I had been wondering if my hebe red edge would bloom, no sign of it and I kind of agree, it looks a bit silly with those little blossoms that seem almost stuck on in the wrong place. Red yucca, insanity! 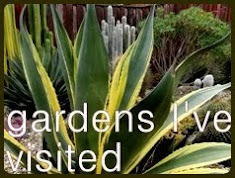 Boy, between that, the agaves, and the sea hollies, you need to wear full body protection to go for a stroll at your place eh? Goggles provided at the garden gate? Or do you only have pug size? K & V - actually the red yucca that is in bloom I bought this year with the bloom stalk already showing (in fact that is why I bought it). However I have another that I bought in bloom several years ago and it had done nothing until this year when it started pushing out a bloom, it's still growing and will open up about the time this one ends it's show. 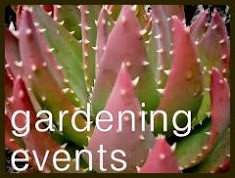 Jane - you should get a Hesperaloe! 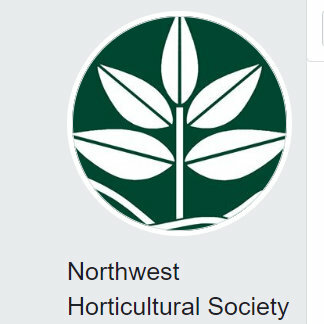 Portland Nursery on Stark has several nice ones. I still feel a little naughty when I cut off the Hosta blooms. But it so improves the look of the plant! Sylvana - thank you! Blue hobbit is very cute, they eventually turn blue (as you can assume from the name) but stay short and compact (again the name says it all...). The leaves are also very nicely shaped. Karen - well with you, Megan and Carol all voting yes for Privet then I think the mystery is solved. I have mixed emotions about the scent. I've thought about picking off the Hebe blooms but there are too many! Luckily they don't last long. Oh and only pug size goggles - you humans are on your own! Me again. 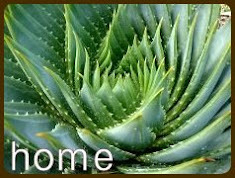 I'm curious to know why you thought I wouldn't like the Eryngium, Loree. As for the red yuccas in Austin, no, they bloom all summer long. The heat doesn't faze them one bit. You know Pam I'm not sure! I re-read what said after I posted it and thought "now why did I think that? "...I guess it is because you have so many beautiful flowers that these just seem a little too "weedy"? 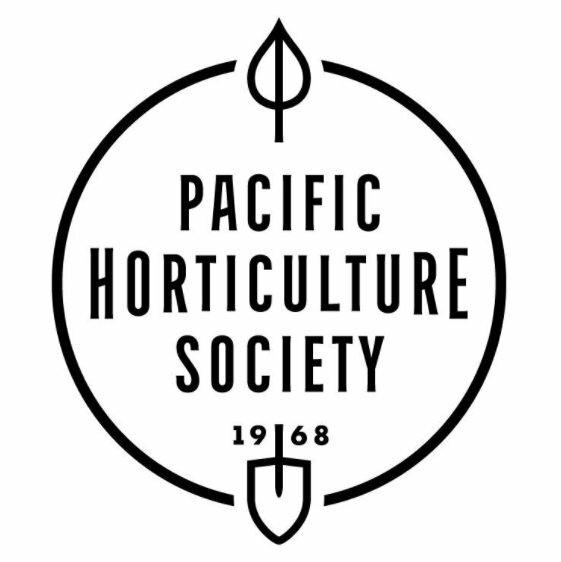 I know several people who dislike them simply because of their resemblance to invasive thistle, maybe that was part of it too? Dunno. No insult meant that's for sure!